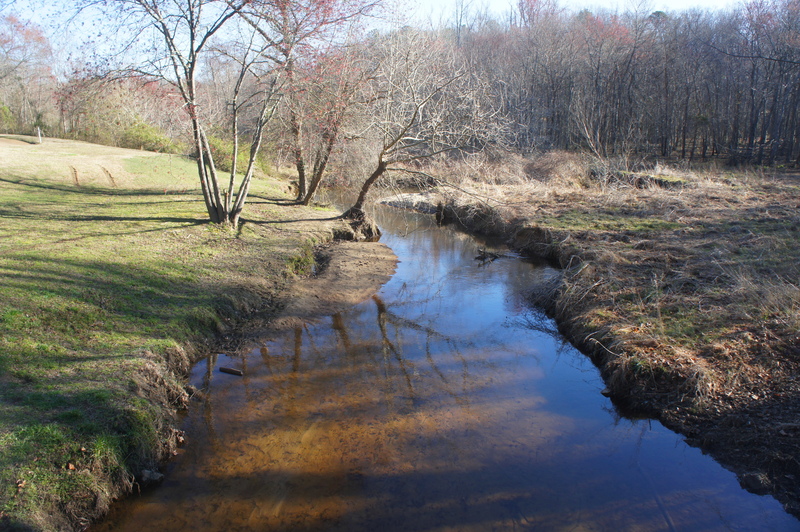 The Battle of Beaver Dam Creek—also known as the Battle of Mechanicsville or Ellerson’s Mill—is widely remembered today for being General Robert E. Lee’s debut as commander of the Army of Northern Virginia. With the Union Army on the doorstep of Richmond in June 1862, Lee embarked on a series of offensive maneuvers to fend off the numerically superior Federal forces. The first of these attacks, at Beaver Dam Creek, was a tactical defeat for the Southerners but a strategic victory; the engagement on June 26, 1862 was enough to persuade Union General George McClellan to withdraw his forces to the east, taking up a new position near Cold Harbor. The battle was second in a series of bloody engagements known as the Seven Days’ Battles and an important point in McClellan’s broader Peninsula Campaign (March-July 1862). The battlefield today has been mostly overtaken by modern development. There is a narrow sliver, however, that is protected as part of Richmond National Battlefield Park: it is a boggy lowland surrounded by dense woods, appearing much like it did during the battle. 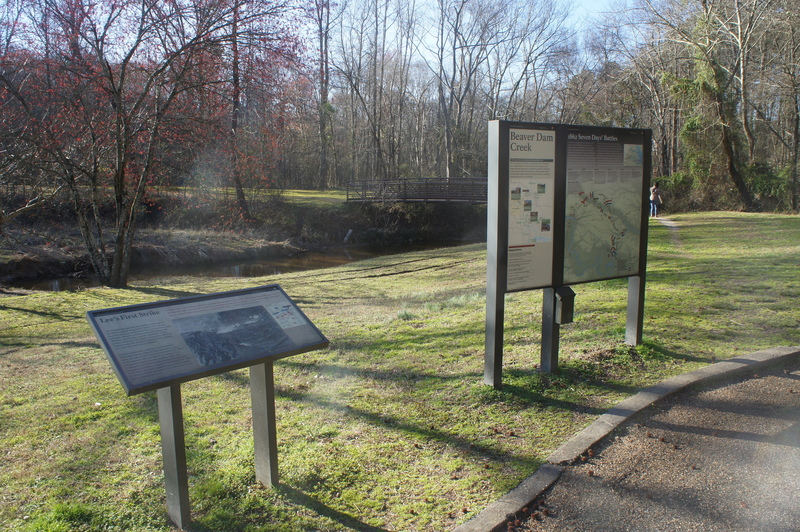 Here visitors can walk a 2/10-mile out-and-back trail that crosses Beaver Dam Creek at a spot that saw intense action during the battle. Driving on Cold Harbor Road in Mechanicsville, Virginia, turn onto the signed road that heads south for 2/10 mile to the Beaver Dam Creek Battlefield parking area. The parking lot lies just to the east of Beaver Dam Creek, today a calm but swampy waterway flowing north to south into the Chickahominy River. As soon as the Federals took this position in June 1862, the Confederates knew their assault would be challenging. One Southern military engineer would later remark that “the enemy took the beautiful Beaver Dam position for his own right.” Moreover, the attack was a risky endeavor: massing the bulk of the Army of Northern Virginia north of the Chickahominy River, Lee risked leaving Richmond exposed to attack by Union forces south of the river. Nonetheless, Lee intended to move forward with the attack on the Federal right on the morning of June 26. The plan called for sending three Confederate divisions—those of D.H. Hill, A.P. Hill, and James Longstreet—east across the Chickahominy to meet the Federals, followed quickly by the approach of Thomas “Stonewall” Jackson’s men from the north. The success of the assault would depend on the timely arrival of Jackson’s men, who were fresh off a lengthy campaign in the Shenandoah Valley. Belying his reputation as an invincible commander, however, Jackson was delayed by lethargy, indecision, and poor navigation. It was not until late in the day on the 26th that his forces arrived at their necessary position on the Union right; they would effectively miss the battle entirely. Meanwhile, impatiently awaiting the start of battle, Confederate division commander A.P. Hill ordered his forces to cross the Chickahominy at around 3 pm, without the go-ahead from Lee. Thus Hill’s division kicked off the day’s battle before the Confederates were ready and met resistance north of the river from Union General John Fitz Porter’s 5th Corps. Yankee pickets fell back to their strong defensive position behind Beaver Dam Creek, and Porter’s corps prepared to confront the approaching Confederates. As Hill’s division ran into intense artillery fire, Lee decided that he “was obliged to do something” now that the battle was underway. He ordered the three Confederate divisions to press ahead with a frontal attack, spreading out across the small town of Mechanicsville. At least four brigades ran right up against Union positions along the creek, failing to puncture the Federal line. One such position was here, at the former site of Ellerson’s Mill, now within the boundary of Richmond National Battlefield Park. Facing the creek, A.P. Hill’s fourth brigade, commanded by Dorsey Pender, streamed down the hillside behind you, running straight into the fire of Truman Seymour’s third brigade of Pennsylvania reserves. Pender’s brigade suffered heavy casualties, as did the Confederate forces of Roswell Ripley that followed them. Much of the Confederate losses stemmed from the strength of the Union forces amid the eastern bluffs overlooking the boggy floodplain surrounding Beaver Dam Creek. Visitors can view the difficulty of the terrain from the parking area: a muddy stream followed to the east by tall grasses and thick brush. 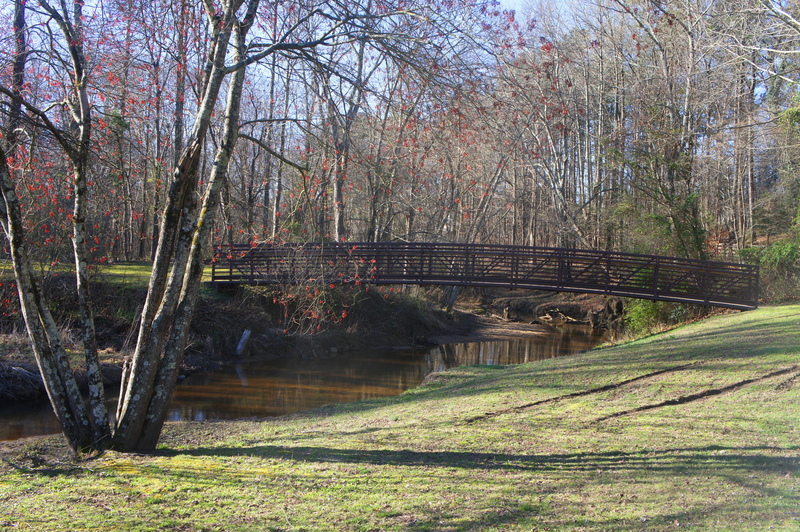 From the parking area, the trail begins by crossing a quaint footbridge, where you can straddle the front lines of the battle. The bridge replaces an old crossing that was destroyed by Union forces ahead of the engagement. 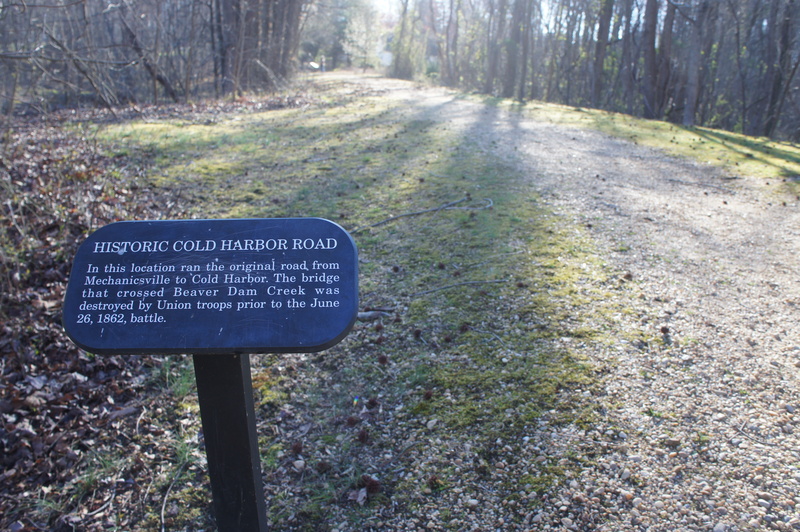 Beyond the bridge, follow the wide, partly-graveled path as it follows the remnants of the Old Cold Harbor Road to the old site of Ellerson’s Mill. Although the millhouse is long gone, one can still see the old millrace as it runs through the woods. The trail ends abruptly thereafter, connecting with a paved drive that enters a residential neighborhood. The battle came to end on the evening of June 26 as darkness fell over Mechanicsville. Lee’s Army was firmly repulsed, owing in large part of Jackson’s tardiness, and the Union suffered less than a quarter of the casualties of the attacking Confederates. However, even as Lee’s debut resulted in failure, he succeeded in persuading McClellan to pull back Porter’s 5th Corps to a defensive position three miles to the east at Boatswain’s Swamp. Here a bigger and deadlier battle would occur the next day. Return the way you came, completing the 2/10-mile hike, a short and easy jaunt that should take no more than 15-20 minutes. Edward Porter Alexander, Fighting for the Confederacy: The Personal Recollections of General Edward Porter Alexander, ed. Gary Gallagher (Chapel Hill: University of North Carolina Press, 1989), 77. Stephen W. Sears, To the Gates of Richmond: The Peninsula Campaign (New York: Ticknor & Fields, 1992), 200-201. Sears, To the Gates of Richmond, 203. Sears, To the Gates of Richmond, 206-207. Michael Weeks, Civil War Road Trip Volume I: A Guide to Northern Virginia, Maryland & Pennsylvania 1861-1863 (Woodstock, VT: The Countryman Press, 2011), 162-163. This entry was posted in Civil War, Easy Hikes, Richmond National Battlefield Park, Virginia and tagged Beaver Dam Creek, Beaver Dam Creek Trail, Civil War, historic, Mechanicsville, Peninsula Campaign, Richmond, Richmond National Battlefield Park, Seven Days' Battles, Virginia. Bookmark the permalink.